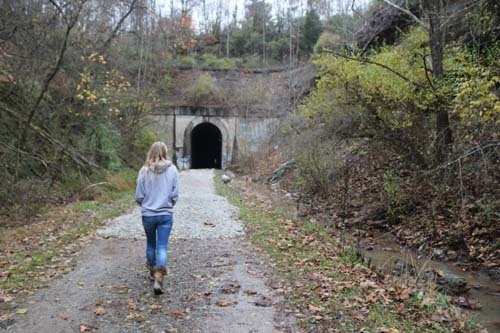 I heard it called the Lost Tunnel, the original #21 Tunnel along the abandoned stretch of railway between Parkersburg and Clarksburg. It has also been called the Bee Tree Tunnel (that was the name of the town of Eaton early on) and it has also been called Eaton Tunnel and Eatons Tunnel. In 1963, after two men were killed during a massive rock fall within, a second tunnel was built nearby. 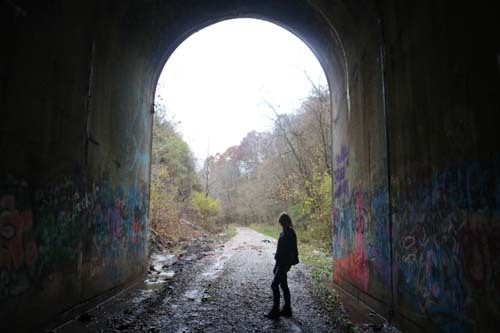 This newer tunnel, you can still walk through on the North Bend Rail Trail near and it is actually this one sitting next to the old where many have run into ghosts. 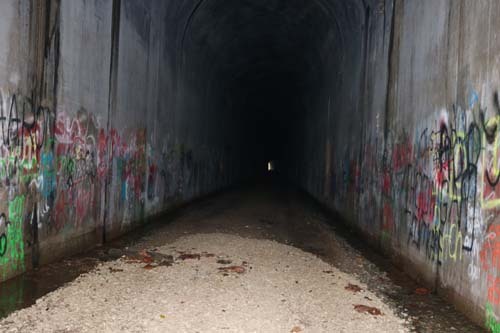 It is no wonder with all the hype the Silver Run Tunnel gets with its white-gowned, golden-slippered ghost that the Eaton Tunnel gets a lesser reputation for a haunting. But I also heard it was haunted and perhaps by the same ghost. It wouldn’t seem out of the ordinary, I suppose, considering it is only 8 railroad-bed miles away and less than a few hours of walking. I mean, she did ride the cowcatchers of many a train from one end to the other. I didn’t think I’d find it. But I did during a cool November rain. I just had to follow the path of countless workers killed during its construction and maintenance and a short, graveled path along the 72-mile North Bend Rail Trail. -The Meigs County Telegraph in January of 1854 mentions a man killed by a fall of rocks during the construction of the tunnel. -The Daily Union. January 25, 1855, describes the death of Terry Duffy on January 8th while in charge of the rope that sent buckets of rock to the surface. One of the ropes was accidentally let loose by a worker and as the attached hook passed by Duffy, it caught on him and jerked him up the shaft. There, the poor man was detached and bounced down the walls of the shaft nearly 125 feet to his death. -The Wheeling Daily Register., August 22, 1865, describes a fall of rock that left 3 men dead and a woman was injured seriously. It does not mention if she later died. -In November of 1866, the Alexandria Gazette mentioned cholera swept through the mining camp at Eaton Tunnel. Of the 100 people living there, fifteen died of the disease in less than four days. -The Public Ledger (Memphis, Tn) noted in a February 1867 article that three men were killed in a rock fall at the tunnel. -The Wheeling Daily Intelligencer., March 22, 1875 talks of a construction car that was placed on the tracks and was hit by a train. A man by the name of Thomas was killed. -The April 1877 Shepherdstown Register reported 5 tramps stealing a ride in a boxcar were killed when a train wrecked in Eaton Tunnel. -The Wheeling Daily Intelligencer noted on March 21, 1890, a man by the name of Simpson was found dead in the tunnel, hit by an oncoming train. -H.J. Garletz, a brakeman, jumped from one train to the other to reach the switch stand. He fell off and was crushed. This was in the Fairmont West Virginian- October 1907. So . . . it isn’t surprising that people report hearing ghostly voices inside the newer Eaton Tunnel #21 next to the old. Some have heard a woman's soft voice calling:“Help me”. Others hear men talking as if they are in a large group working their way through the tunnel. Each time my daughter made an allergy sniff inside the damp tunnel, there was a short lull before there was a soft sniff reply. Trying to make light of it (she is dauntless, but it is a bit intimidating in the darkness at some points), I laughed it off to her and said hello sarcastically to show her there wasn’t anybody (or anything) else inside. There was a clear hello (that was not an echo, nor a person) in return. It was an epic fail at trying to cheer her up, but she persevered with just a roll of her eyes in the lights of our cell phone flashlights. 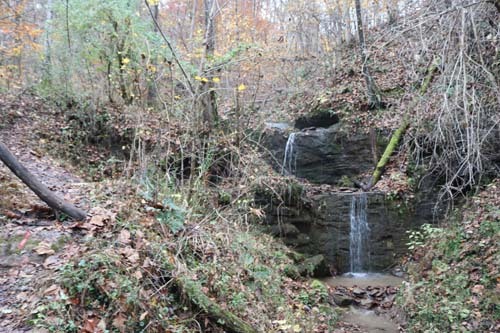 Still, there are also accounts of the spirit of the young woman who once haunted the railroad engineers along this route from Clarksburg to Parkersburg showing up in her white, flowing gown and riding the cowcatchers. We didn’t get to meet her. However, maybe you can. Some have even been followed by this ghostly figure. She remains just far enough away to make out a filmy dress and flowing hair. And scare the beejeebus out of even the most level-headed folks. You can visit Eaton Tunnel. It is along the West Virgina Rails-Trails. Please make sure you follow their rules along the trail. Bring a flashlight! Trail Access Parking: 39.195872, -81.313750 Once you park, if you are facing the trail and guardrail, just hike to the right to get to Eaton Tunnel #21. 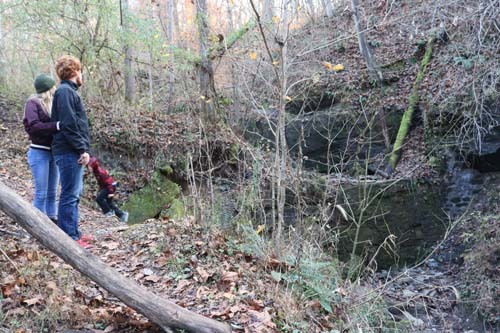 To get a peek at the Lost Tunnel (also #21, but the one that caved in) you walk through the Eaton Tunnel and on the left side there is a short trail leading to the old tunnel.